Learn about the social media marketing in less than 60 seconds. Engage and build relationships with your potential and current customers. Social media has connected the world in a way that hasn’t been seen before. From Facebook to Twitter, these platforms allow businesses, big or small, to build strong relationships with their customer base well before they ever do business. With thousands of people being able to find your business with a simple search, don’t you think it’s time to build your brand and make yourself known in the social space? Your customers are already there. 80% of consumers prefer to interact with a brand through Facebook. You’ll benefit from connecting and engaging with customers where they already interact and spend most of their online time. Boost word-of-mouth marketing. Social media extends the reach of your content and offers a valuable communication platform with your customers. This nurtures loyalty, builds new leads, and fosters stronger relationships within your client base. Build your online reputation. Your social media presence builds trust and loyalty. The proof is in the numbers: People are 51% more likely to buy after ‘liking’ a brand on Facebook. 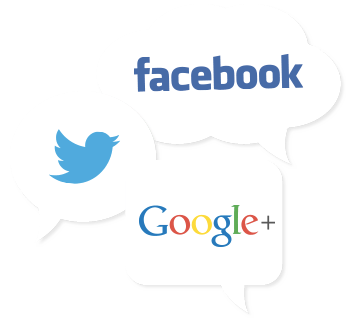 What Will Autoshop Solutions and Social Media Marketing Mean for Me? Want to increase customer loyalty and returning customers? This client saw a 1,221% increase in local Facebook fans that really do like him. 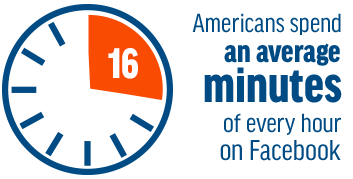 72% of Internet users are on Facebook for an average of 21 minutes each day. Make sure they’re seeing your brand and thinking about their next auto repair need. Named as one of the Best Places to Work, Autoshop Solutions has the industry’s top digital marketers and the best customer service to help drive online traffic to your shop. We deliver on commitments and strive for a flawless customer service experience so you can achieve marketing success! Higher Search Rankings. Search engines are taking more and more cues from social media, increasing the importance of having an active social network presence. This improves your rankings, drives traffic to your site, and gets customers into your doors! More customers. Facebook handles close to 1 billion searches per day, rivaling Google in total search volume. Many of these inquiries include searches for local brands or company pages. Love for your brand. The automotive industry values honesty and transparency. By establishing an online presence, it allows you to build a relationship with your customers well before they enter your shop. Expand your brand. We create a unified, branded experience for your customers across all social media platforms, including Facebook, Twitter, Google Plus, and Google Local. Whatever platform your customers use, they will be able to find you! Build your community. We build your online presence through thoughtful social media campaigns that focus on your geographical location. We create fully customized posts for your social media channels and target your local audience with keyword-rich content that is fun and engaging. Inspire Action. We utilize clever social media advertising techniques that get more motorists into your shop. Our ads will help build urgency, inspire action, and help familiarize your brand with the local community! Monitor feedback and mentions. Our social media management and monitoring tools quickly inform you of new leads, respond immediately to potential customers who engage your brand, and monitor online reviews. 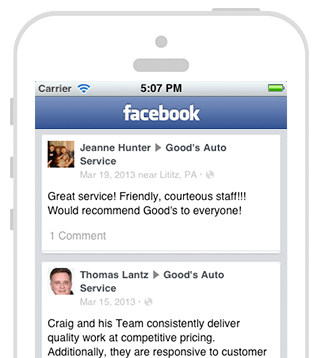 With the automotive social space growing by the day, you can’t afford not to have an active social page.